Here's a brief video that gives a good explanation of the adverse impact of the Supreme Court's Citizens United decision on American democracy. Is Bank of America a Person? According to the Supreme Court it is, the same as you and I are. In 2009 the U.S. Supreme Court issued a landmark decision in the Citizens United case, which essentially endowed corporations with personhood under the Constitution of the United States. This gave corporations the right to spend unlimited amounts of money from their coffers to try to influence elections. This ruling, combined with an earlier ruling that equated monetary expenditures in a political campaign to speech, directly threatens the concept of democracy, that is, rule by the people. The founders of our nation guaranteed citizens the right to speak freely and voice their opinions in public forums. This right was given to citizens. They even looked critically on corporations, limiting their existence in the early years of our nation to 20 years. This is no longer the case, and corporations, created through and governed by laws, can easily outlive generations of humans. The Citizens United case slammed the door on provisions in the McCain-Feingold Act that limited the amount of corporate contributions to political campaigns. Granting a non-human entity created by law the same rights as human citizens runs contrary not only to the intent of the Constitution, which was written to protect citizens, but also to common sense. This ruling effectively drowns out your voice and my voice and the voices of millions of people because the CEO of a corporation can now spend unlimited amounts of corporate cash to influence elections. If you think this is a problem, you can have an opportunity at Town Meeting in March to register your disapproval. Petitions are being circulated throughout Vermont to have a resolution on the agenda in as many towns a possible to urge Congress to pass an amendment to the Constitution to declare that corporations are not persons and that money is not speech. You can find and sign this petition for Charlotte at the Old Brick Store, at Spear's Store, and at the library, Senior Center and Town Office. You can also print, sign and circulate this petition here. Then return it to the Town Clerk's office by January 6th. Let's put Vermont on the record opposing corporate personhood and save our democracy from turning into a corporatocracy. 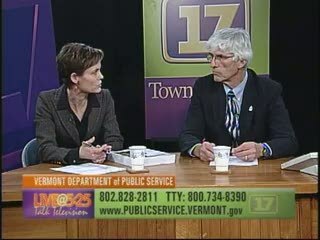 Elizabeth Miller, Commissioner of Vermont Department of Public Service appeared with Rep. Mike Yantachka, Chitt 1-2/ Assistant Treasurer, Chittenden County Democratic Committee, on the Chittenden County Democrats Show to discuss Vermont's energy future as outlined in the Comprehensove Energy Plan. You can view this half-hour segment here. As we enter the holiday season, Vermont’s state legislators are getting ready for the 2012 session that will open on January 3rd. While there are a number of issues that will have carried over from this year’s session, the extreme weather events of 2011 will be foremost on the agenda. House and Senate members were called back to Montpelier on November 10th to hear reports on the status of the Hurricane Irene recovery effort, the Green Mountain Care health system planning, the economy and fiscal situation, and the Comprehensive Energy Plan. The good news is that the repair of the damage done to state roads will cost a lot less than was originally expected, about $185M instead of $550M. Also, for the first three quarters of the year state tax revenues were up. Senators Patrick Leahy and Bernie Sanders led the effort to restore disaster relief funding in the U.S. Senate, and Congressman Peter Welch organized a bi-partisan coalition in the House to do the same. The result is that federal funding will reduce Vermont’s share of the restoration to about $40M. However, the effect on municipal revenues as a result of tax abatements due to property losses compounded by the additional costs to local roads is considerable, and the loss of state tax revenues post-Irene has not yet been determined. These are factors that we hope will be known by January. In all probability we will have to budget for both spending cuts and revenue increases. The 2011 session resulted in a number of significant pieces of legislation that have implications for 2012. The Green Mountain Care Board has been meeting and is in the process of analyzing and mapping out a strategy that will be presented to the legislature in January. The Energy Bill of 2011 required two reports, a state energy plan and a biomass evaluation report, to be completed and presented to the legislature by the end of the year. The Department of Public Service has held hearings throughout the state on its draft Comprehensive Energy Plan. It is now reviewing more than 2000 public comments that it received and will have the final report ready by January. The non-governmental Biomass Energy Research Group has been analyzing the capacity of Vermont and nearby states for sustainable harvesting of low-grade biomass to be used as a source of renewable energy generation. There have been three new biomass electric generation plants proposed for southern Vermont which will require legislative approval before they can be built. Two plants, one in Ryegate and the McNeil plant in Burlington, have been operational for decades in northern Vermont. I very much want to know what concerns and thoughts my constituents have, so I will be holding a general information session at the Town Office on Thursday, December 8, at 7:30 PM. I invite you to attend and let me know what’s on your mind that the legislature needs to address. If you can’t make the meetings, you can always reach me by phone (425-3960) or by email (myantachka.dfa@gmail.com).